The replacement lens for Air Optix Aqua, which is being discontinued by the manufacturer. 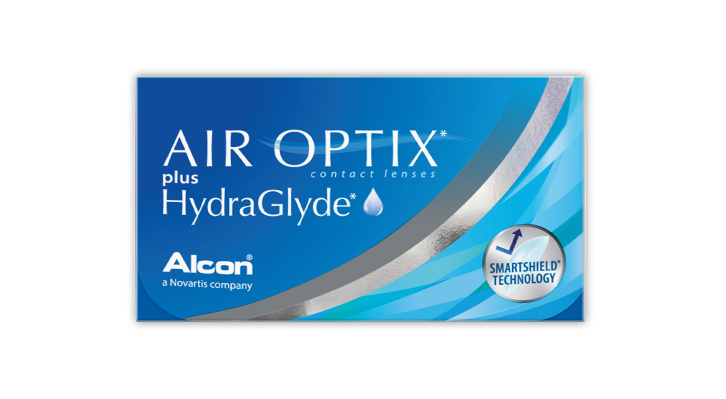 Air Optix Plus Hydraglyde combines a new level of comfort with enhanced Oxygen capability ( Up to 5 times greater oxygen transmissibility than traditional soft contact lenses) , which provides superior all day comfort in a lens that is healthy for your eyes. The Hydraglyde Moisture Matrix Technology is an innovative reconditioning agent that embeds in soft contact lenses and means the lenses retain moisture for longer, boosting comfort levels throughout the day. SmartShield technology creates a water loving environment that delivers better daily deposit than any other 2-week or monthly silicone hydrogel lens. This allows the wearer to enjoy clear and comfortable vision which lasts all day. Advanced lens optics results in a thin contact lens edge at the points where you need this most, where the lens interacts with your lids, which results in excellent comfort. These lenses offer fantastic clarity of vision even during intense focusing and concentration. Each box Contains 3, monthly disposable, soft contact lenses with a light blue handling tint in a buffered saline solution. Be the first to write an online review of Air Optix Plus Hydraglyde and share your thoughts on this product with other shoppers!